"A teenage boy killed himself last week after his female friend accused him of sexual abuse, and then retracted the claim. ​According to the Argentinian news site Infobae, it started in December, when Agustin Munoz, 18, marched with other young people through the center of his native Bariloche to protest violence against women. The demonstrators chanted: "Never again, never silent." At one point in the march, names of alleged sexual abusers were read off in a public shaming. Munoz's name was announced to the crowd because his friend, a fellow feminist who was identified only as A., had reported him. "In the middle of that march, they shouted his name, and he was stunned," Munoz's mother, Silvina Castaneda, ​told the Bariloche 2000 news site. "His first thought was to run home." After her son explained what happened, Castaneda said, she contacted the female friend, who immediately admitted the allegation and apologized. Castaneda angrily posted online the woman's text and voice mess-sages asking for forgiveness. "I don't want any more madness," one message said. Despite Castaneda's efforts to combat the accusation against her son, it continued to spread online, and Agustin became depressed. "He was in very bad shape, in bed, he did not want to eat," Castaneda told Infobae. Just when Munoz seemed to be improving, Castaneda told Bariloche 2000, he got into a fight with his girlfriend on her birthday, and his mood sunk lower than ever. Munoz "was a different boy and his emotional state was very weak ... like so many others . ... please look for tools to let our children grow without fear," Castaneda wrote on Facebook. Later, in a video posted online Saturday, she and her husband appeared with Munoz's peers and warned of the destructiveness of false sexual misconduct allegations. Less than a week after the march, on Dec. 23, Castaneda posted online that her son had killed himself. "My son died yesterday with his heart broken," she wrote. Castaneda said that her family had been close with the young woman, and that she and Munoz "loved each other very much." Out of respect for her son, she has decided not to shame the woman who shamed him, or to take further action. "As a mother, as a mother accompanied by a father, I urge you to take care of our children, to take care of our children because there can not be another Agustin," she said. ​Feminists are on the march in Argentina, both figuratively and literally. Earlier this month, a popular radio host was ​court-ordered to hold scripted conversations with gender specialists as punishment for making sexist statements on air. That was days after the country's parliament passed a law requiring all officials to undertake gender equality training. In July, National Public Radio reported on a popular daytime talk show in Argentina, "Intrusos," that unexpectedly embraced feminism ahead of a vote on legislation to legalize abortion. In August, however, the bill was voted down. American media has generally celebrated Argentina's progress on women's rights almost as an extension of the domestic #MeToo ​movement. In both cases, attitudes toward women have clearly changed, which advocates hope will translate into decreased harassment and abuse. However, less reflected in the press coverage is the dark side of such activism, which can encourage the ​vilification of men, sometimes with tragic results." As you can see no repercussions whatsoever were brought upon the lying whore. So whats the lesson here FJers? Feminism is rad, don't be an incel. 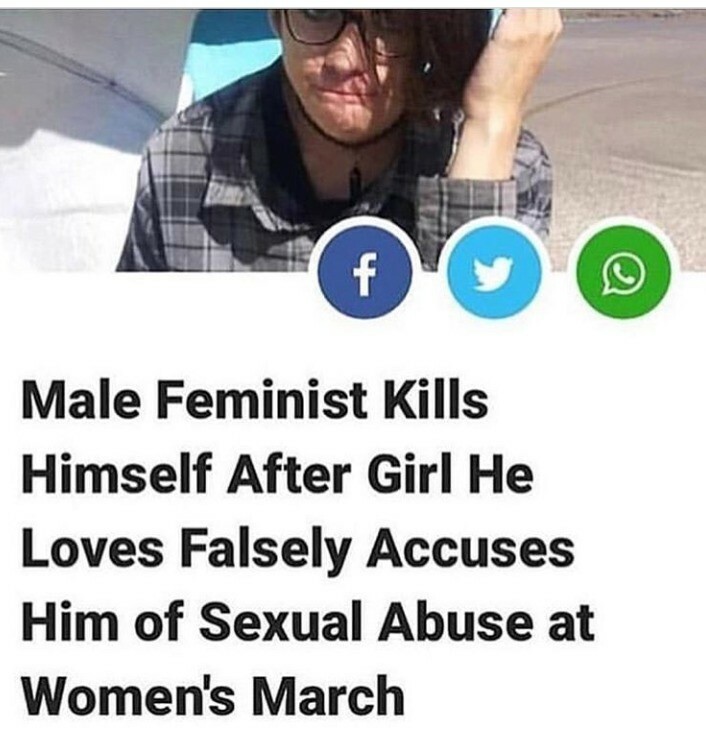 Never side with a feminist.